All of you muscle car fans out there can take another swig of Bud Heavy because there’s a new extra beefy Hellcat from Dodge: the Dodge Challenger Hellcat Widebody. Don’t overthink the name. Dodge didn’t. This is like a Hellcat, but wider. You might be thinking Hey! I’ve been tricked before. I remember when the Big Three said they were making hot new muscle cars for the ‘70s and all we got were big bumpers and tape stripe kits. But you’re no dummy. You’re a real American muscle connaisseur. Conasseur? Connoisseur. That’s it. 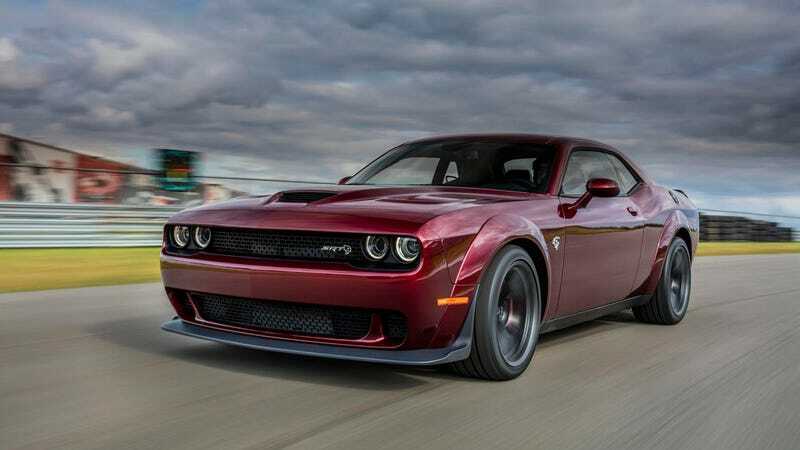 Anyway, you already know that the Dodge Demon is built like a Hellcat with a 3.5-inch wider body widebody kit on it to fit extra muscly 305-section tires. The Demon needed all of that tire for its extra-powerful 840 horsepower engine. Well, this new Dodge Challenger Hellcat Widebody does not get the Demon’s extra power, but it gets all of the body and tire modifications: the same Demon fender flares, the same Demon tires. That means the MSRP is just $71,495 instead of the Demon’s $84,995. A base Hellcat is $65,290, so we’re looking at a hair over six grand for bigger wheels and tires and fenders to match. The added grip drops the 0-60 time by 0.1 seconds, from 3.5 to 3.4 and the quarter mile by 0.3 seconds, from 11.2 to 10.9. It’s for the muscle car human who wants to rip corners so hard that their eyes water. Bring on the Gs they scream into the road courses of the country. Gingerman, Mid Ohio, Spring Mountain, Willow Springs, Summit all howl with the twin baritones of suprcharged V8s and grunting owners. I needed this! I need the grip! I’ve got the power!